Dubarry of Ireland began life in 1937 as makers of high quality leather shoes, so it is unsurprising that one of their best loved products is the iconic Galway boot. A classic unisex design, these boots are designed to withstand anything you can throw at them (which makes them perfect for a typical British summer)! Each component of the Galway has been rigorously tested to ensure that it will be as rugged and comfortable as possible. Starting at the base of the Galway, the durable rubber soles are directly moulded to the leather upper to create a watertight seal. This means that your feet are more likely to remain dry whilst walking through a muddy puddle or checking a water obstacle, compared with other boots held together with glue or stitches. To ensure that you can wear these all day, the rubber outsole has been combined with a spongy polyurethane innersole to cushion your feet. Next up is the GORE-TEX® lining. Like the moulded rubber sole, it is another element that Dubarry have added to keep your feet as dry as possible by ensuring that no moisture can penetrate through the boot, whilst wicking away perspiration. No wonder GORE-TEX® is known as the ultimate waterproof membrane! And finally we come to the extra special leather that is used on these boots. It has been tanned and treated in a way that is unique to all Dubarry leathers. These processes strengthen the leather and make it much more supple, with the added benefit that it absorbs much less water than other leather boots. The Dubarry website even states that it takes 70% less time to dry naturally than other types of leather! However, the Galway boot is not just substance. The boot is constructed from a combination of both smooth and crushed leather, which give the classic riding boot design a distinctly Dubarry twist. There are a variety of colour combinations to choose from including the iconic Walnut boot, and a couple of new colour variations will be added in AW14. Add some subtle Dubarry branding on the side, and these beautiful boots definitely stand out from a crowd! The combination of perfect styling and perfect substance means that these little beauties will see you through almost every occasion (the ballet may be an exception)! They are amazing with leggings whilst walking the dog through a muddy country lane, they would look awesome with jeans for a rain drenched festival and they would stand their own worn down Oxford Street (once you’ve washed off all the mud from the previous events)! But don’t just take my word about the greatness of these boots. Our customers consistently give the Galway boot top marks in their reviews, praising their superb quality and great fit. One even goes as far as to say they are the only boot to have! 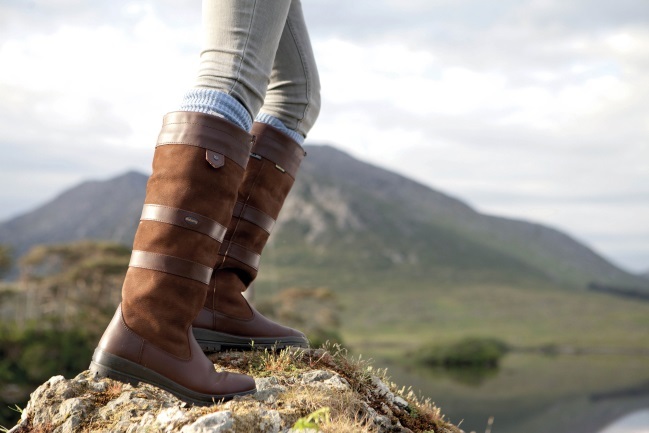 As Dubarry have recently introduced ExtraFit™ and SlimFit™ versions alongside the standard width, there’s no excuse not to treat yourself to a pair! Dubarry, Dubarry Galway boots, Dubarry of Ireland, Footwear, mens footwear, Reviews, womens footwear. Bookmark. Perhaps he should wear the boots a little more often. I am now on my third pair, two replaced by the maker because each has fallen apart. I know of none whose boots do not leak after three years, if worn regularly two is more likely. For the price not a bargin. We’re sorry to learn that your Dubarry’s have developed a fault so soon. We put our absolute trust into Dubarry footwear so it is a rarity to see these faults occur. Hi, I have a pair of Dubarry Galway boots, purchased for my 40th Birthday, just over 10 years ago, which are still functional, waterproof and going strong – I just love them. the only downside is the wide calf as i have slim long legs, , I see you now do a slim calf version and I am very tempted to treat myself to a new pair, but have heard many reports that since the manufacturing is now in Portugal not Ireland, the “build quality ” is not the same as my original boots and I really do not want to be dissapointed . i am happy to send you photos of my fantastic boots which have weathered extremely well in all weather, shooting, walking and riding . Hi Julia, thank you for your message.